If you are interested in all in the Christian faith, you should read this book. Pope Benedict XVI takes various aspects of our faith and puts them into a scriptural context. For example, the parable of the Good Samaritan – the Pope says that the man who lay by the side of the road, beaten, stripped and robbed is symbolic of Adam, and of man in general. He compares the fate that befell this man to the fate of the poor, the afflicted, the victims amongst us. Benedict challenges us to be good neighbours to these people. Taking it a bit further, I have at times tried to imagine myself as each of the characters in the story. I can perfectly understand why some people walked by – he might have been dead, it might have been a trap laid by robbers, it might have slowed me down after the sun had gone down and put my own life in danger! I can also imagine being the victim of violence and rejection. I have imagined being the innkeeper, trusting that the Samaritan would be back to pay an extra costs, accepting a guest who was clearly going to be “high maintenance.” And occasionally I have wondered if I could ever be the Samaritan – on the fringe, unwelcome in good company, but forgiving and able to do the right thing when no one, not one person, would blame him for walking by. What kind of neighbour am I to God’s people across this world, some as far away as the other side of my fence? Not to simplify it, but the Pope’s writings tell us we're on the right track. The Catholic faith is under a lot of pressure these days. If there is some sort of "other" agenda in the Catholic church, I’ve yet to discover it. This Pope speaks of love, a love which transcends religious differences and is rooted in Christ. One doesn't have to be a member of the Catholic faith to agree with that. Good - atmosphere, thin-crust pizza, creativity. The Pollo Pizza was recommended by Barbra Streisand (it says so right on the menu) so I tried it. It was a nice light lunch; I liked it, but it wasn't so good that I'd have Il Fornello cater my food on my private jet to Boston, like Babs did. 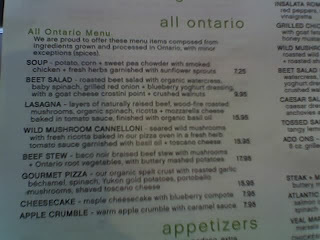 Great - "all ontario" section on the menu (but who would have thought of putting potatoes on a thin crust pizza? I didn't try it, so maybe it's a good idea.) Nice to see some support of Ontario grown produce, apples, blueberries, locally raised chickens... Other restaurants should follow suit. Room to grow - service. Less than attentive. Charlie's Angels was playing on the TV at the bar, so it took precedence over guests in the dining room. I waited a long time to have my order taken, my cheque delivered and I really could have used a refill on my water. The waiter just wasn't around much, and it wasn't because it was busy. This is the ultimate service trap - when it's not busy the staff get distracted with non-service related things - like TV and each other at the bar. The ultimate comment card question (the only one that matters): Would you come back?